Alice is looking for the old world civility in her brave new one. Thus Alice relies on reflexes she knows will never operate properly in wonderland, rather like a person recently losing their sight seeks to remember colors. Alice wants desperately to understand the new creatures around her, but memories from her old life are all she has. However, those around her are bound by no rules at all and therefore can act irrationally. The irony is that in a children’s fantasy land come true, Alice cannot enjoy herself and instead must become the adult foil while the magical creatures around her play at a tea party. Ultimately, She can do little but accept the tea party that has gone on for long before she arrived and will continue long after she leaves. What can we say, Alice? Don’t mess with tradition. The English are an ancient people and they have exquisitely long memories. Nonetheless they know it is a turning world and that they must innovate to survive. But to innovate on tradition without losing touch with the ancients is burdensome. One cannot do so randomly but only through careful attention to what has come before. One sartorial chapter must follow from the one preceding it, like in Burke’s chain novel of history. Which is why when the English update something it still has the gravitas of an old world grandee about it. There is a movement on the row to blend the current with the traditional. And the English do it well, at least for men’s clothes. It is interesting that though other cultures claim to be more cutting edge, only the English seem to be able to blend the absolutely current with the time honoured gentlemanly ideal. It’s Austin Powers, it’s Clockwork Orange, it’s Brave New World all blending with the middle class approach to looking smart and needing to get it right on the first go; due in large part to an absence of resources to experiment with. The English, again, trump all cultures by creating a perfect crossroads of design, solidity, comfort, longevity, class elegance and value. Whereas the Italians make things more beautifully, they do not design them as solidly, and whereas the French make things more elegantly, they do not make them as seriously; while the Americans may outdo all others for innovation and practicality, they cannot achieve that centuries old aristocratic look that it seems the English of all classes can tacitly agree on. Kilgour leads this movement of keeping the Row current without surrendering one Anglo-Saxon inch. I had occasion to discuss the Kilgour aesthetic and its appeal to both the English and its international clientele. The English like a slimmer fit of suit around the waist than do the Americans. This look is ironically not accomplished by a tightening of the jacket waist but rather by a fitted and more shaped chest. Typically, greys and navies are most popular both in solids and simple white or grey stripes. 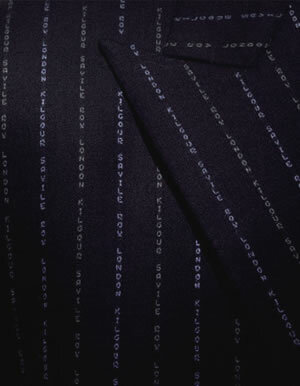 They did a black fabric with small white spots and it sold out in Scotland but not at all near London. Navy bespoke suit by Kilgour, sky blue double cuff shirt, silk/ woven tie, black leather loafers, hand-blown glass cufflinks. Kilgour is one of the oldest established tailors on Savile Row with workrooms there. Style-wise everything that goes into the ready-to-wear collection has a degree of handwork involved in it, which bridges their past with the present interest in luxury in readymade articles. Although the target market is international, the taste mindspring is English. That is, English with the acknowledgement of a larger world out there. Kilgour has a distinctive look; spots and stripes need to be worked into the collection in places like a suit’s lining or a shirt, even if it is tongue-in-cheek such as spots appearing randomly all over a rain Mac’s shell fabric. That’s Kilgour, tipping a quintessentially English item in a younger, more cosmopolitan direction. Each collection is designed to work together without seeming pat. Thus, continuity and flow is essential for any item that is carried by Kilgour; there is a method to the madness. A new generation is taking the lead in London, and brown shoes, black background ties and other hitherto scandalous items are bleeding into the rain painted cobblestone landscape of London’s City. Similarly, weights of fabrics are getting lighter. Gone are the 13-14 oz-per-yard suit cloths of yesteryears West End, and now the 10-11 oz forms the backbone of the English wardrobe. Kilgour epitomizes updated and refreshed English style. Sky blue mohair suits, light grey worsted wool suits. Customers today are often men who do not have to wear a suit but choose to wear one. Although not corporate, a sky blue mohair suit for someone getting married or in advertising or even film is something smart and elegant. It’s also versatile because the suit jacket can be worn with jeans. Many of these customers are acutely aware of what image they want to convey; important but up to date, and cool. Flannels and flannel blends are very much a part of Kilgour’s collection. Wool and angora blends are used both for overcoats and tailored suits. Mohair and tonics in the 50s and 60s were all the rage in London, and now they’ve returned; there’s an awful lot of shine in men’s suits in vogue at the moment. Wherever the best tailoring fabrics reside for the purposes their customers require, there you will find Kilgour sourcing materials. Thus for the 10% cashmere lighter weight flannels, Loro Piana makes one with fluff but not weight. Harrisons of Edinburgh makes beautiful quality mohair which is rich with 60% kid mohair and used often by Kilgour for their custom makes. Other fabrics are designed for their ready-to-wear collections, and they always keep yardages for customers who want the same ready-to-wear designs custom made. For example, a super 140s Swiss cotton shirt cloth in a sky blue with a subtle pink and white stripe. Or, an English mill making 60% mohair cloth in colors that say Kilgour including denim blue, amongst others. 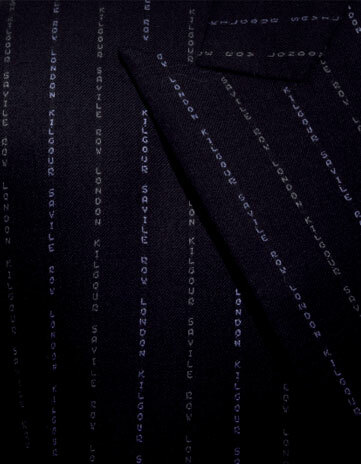 A finely striped cotton/wool suit in black or navy is a Kilgour signature. 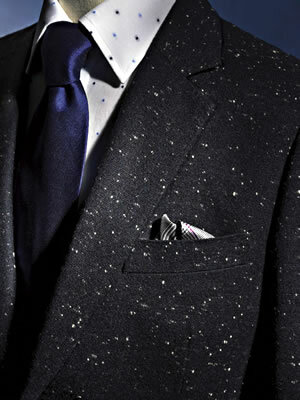 And do wear your mohair suit with a polo shirt in the evenings and a shirt and tie to the office. And if you want to wear the jacket with jeans, Kilgour launched its own tailored jeans line in Autumn ’07. Single breasted notch or peak lapel and fitted, one-button jacket, side vents and moderately slanting pockets is the Kilgour look. That said, they readily make two and three button jackets for City customers who so request. Single breasted, one button, peak lapel jackets are very popular for odd jackets worn with a pair of jeans. Kilgour has always been seen on the Row as a very progressive tailoring firm, even in years past. Tommy Nutter, the refreshing savior of the row in the seventies, apprenticed at Kilgour. And though it respects tradition, it seems that a lot of the City of London rules are easing up and that brown shoes and lighter shades of suits are sighted more regularly in that environment. Is there a difference between a very well dressed man and a dandy? They believe there is. If you could dress one of each, what would you choose? 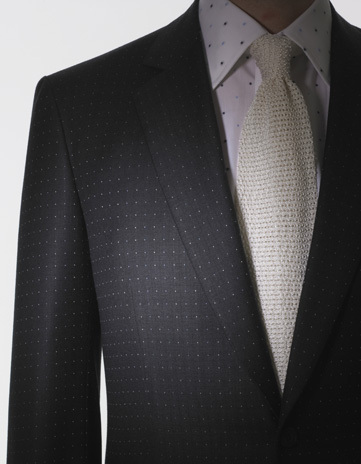 Dandy: Suit in single breasted, three button navy with white chalk windowpane pattern, or a double breasted navy suit with with a small all-over white pindot pattern, striped shirt, chocolate-brown shoes in calf. Side strap buckles on the pants. Lilac socks, Duchamp cufflinks, A Duchamp necktie, a flouncy pocket square which would refer to the Bengal striped shirt. Dandies make more of statement with color. Very well dressed man: Charcoal grey one button, beautifully tailored, with black suede lace ups with little or no brogueing, simple socks, soft pink shirt either solid or with a fine almost invisible pattern like a mille raie stripe, a solid knit tie with a pointed bottom, solid silk pocket square (The English are not overly fond of dry or linen pocket squares) with contrasting trim, and their murano hand blown cufflinks which are unique to the shop and sum up the Kilgour brand. Well dressed gentleman rely more on cut and simplicity. Customers come to Kilgour for a very specific look. They are interested in our shape, which is a lean body with structured shoulders and slim waist, subtle detailing, a strict colour palette (very dark navy, tonal greys, light pink, sky blue, white, black), and an overall modern, clean look. Customers come to Kilgour because of the handmade detailing, exclusive fabrics, and expert finish. Kilgour suits are famous for their structure, the slim silhouette and the way they enhance a person’s body by hiding any imperfections and putting all qualities forward. Although Italians generally look for a softer, unstructured and more relaxed suit, while Americans look for a boxier silhouette, all our customers come to us because they appreciate the English cut of our tailoring. 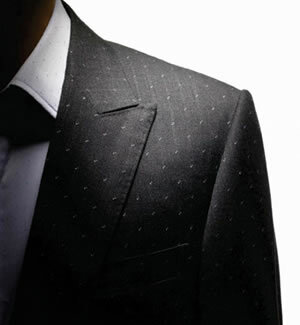 Our Tailoring is designed to make one disappear into one’s surroundings, a bit like urban camouflage. 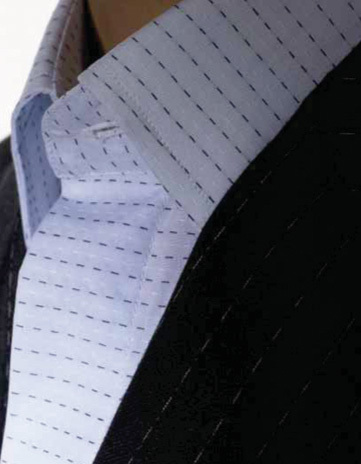 Our garments are all about the detailing, the quality of the cut, and luxurious fabrics. We work on the inside of the garment more than on the outside! We strive to make garments that are about a restrained luxury: the shape is beautifully structured, and the detailing on the inside harks back to bespoke principles. For example, our half-lined system with contrast colour piping, all hand work, or details of piping under collars. The materials we use are very important: textures such as silk scarves, knitted ties, superfine cotton shirts, mohair suits for evening, all add interest while retaining a thoroughly English, reserved feel to the look. The ultimate Kilgour look would have to be a 1 button charcoal grey Super 160’s Wool suit with a peak lapel, a crisp shirt in white, sky blue or dusty pink, and a textured navy silk knitted scarf. For winter, we do a super dark navy needle cord suit, with a crisp white shirt and the silk knitted navy scarf. We also have beautiful silk printed scarves with spots and stripes, which are the only patterns allowed in the Kilgour wardrobe. 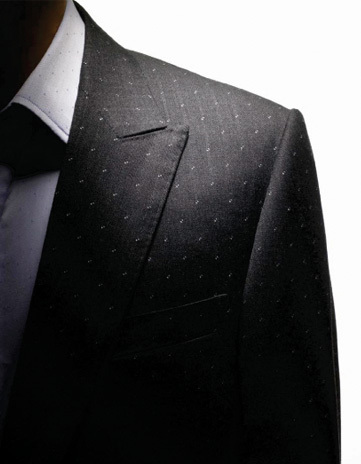 These patterns also add to the restrained, modern look of the Kilgour man.